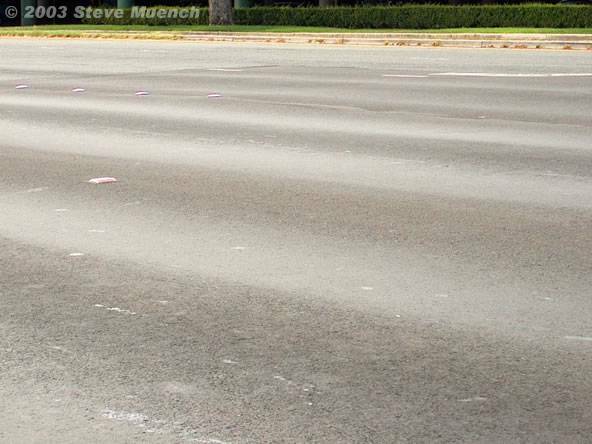 Assist in identifying basic HMA pavement damage. 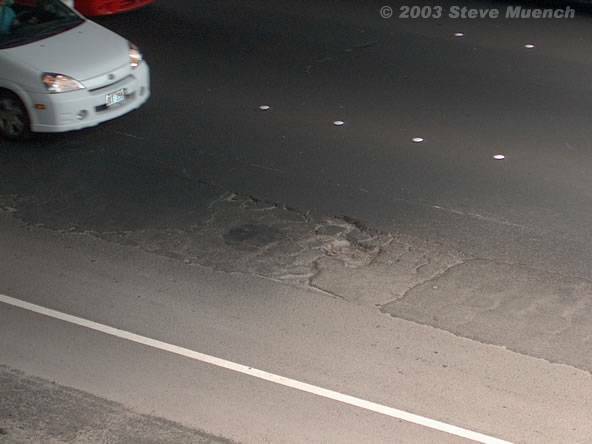 HMA pavement damage that is visible at the surface of the pavement is often called “surface distress”. Provide some insight into why particular surface distresses are problematic. Provide some basic guidance into what kinds of conditions might lead to certain surface distresses. Suggest some basic repair strategies. This section is organized alphabetically by type of surface distress. If you are looking for a specific type, scroll down and look at the thumbnails to see which picture most closely matches the condition you are investigating. Photos of each type of distress are accompanied by a description of the distress, the reason it is a problem, some of the most likely causes and basic repair strategy. 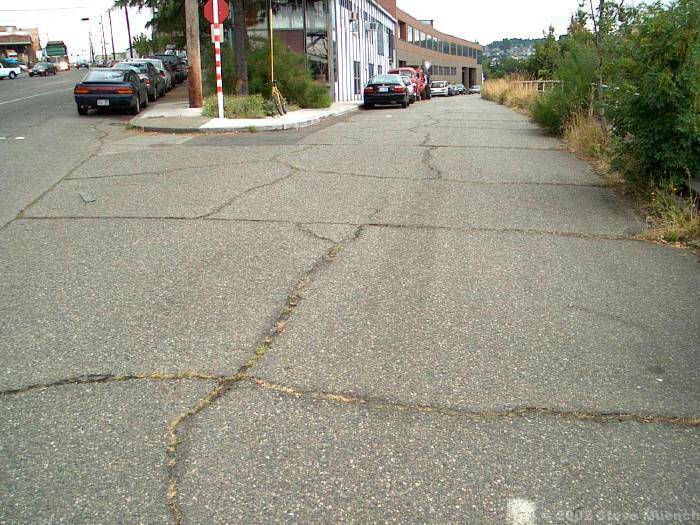 Distressed pavement is often a result of a combination of factors, rather than just one root cause. There are always exceptions to the rule – the exact condition you are looking for may not be here. Please contact your state DOT or Pavement Association for assistance. Severe alligator cracking near the stop line at a major arterial intersection. Severe alligator cracking in a major Honolulu intersection. 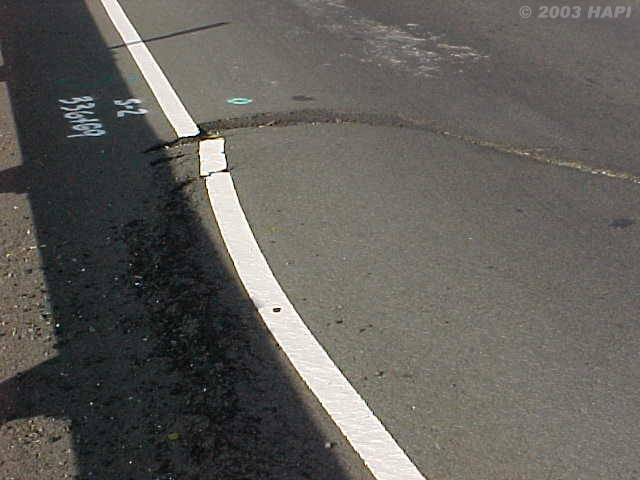 Description: A series of interconnected cracks caused by fatigue failure of the HMA surface under repeated traffic loading. As the number and magnitude of loads becomes too great, longitudinal cracks begin to form (usually in the wheelpaths). After repeated loading, these longitudinal cracks connect forming many-sided sharp-angled pieces that develop into a pattern resembling the back of an alligator or crocodile. 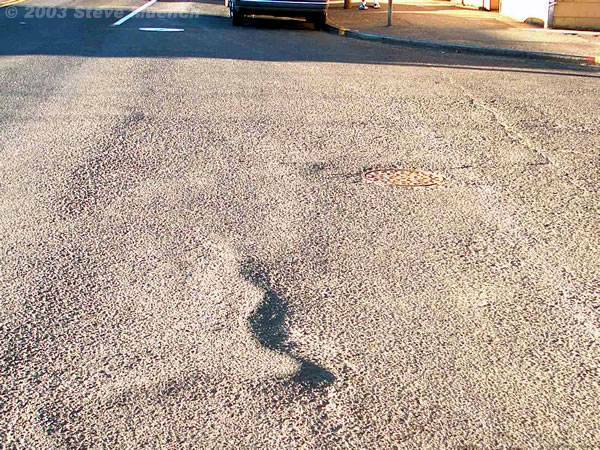 Problem: Roughness, indicator of structural failure, cracks allow moisture infiltration into the base and subgrade, eventually results in potholes and pavement disintegration if not treated. Decrease in pavement load supporting characteristics. Probably the most common reason is a loss of base, subbase or subgrade support from poor drainage. Water under a pavement will generally cause the underlying materials to become weak. Stripping on the bottom of the HMA layer. The stripped depth contributes little to pavement strength so the effective HMA thickness decreases. Description: A film of asphalt binder on the pavement surface. It usually creates a shiny, glass-like reflecting surface that can become sticky when dry and slippery when wet. 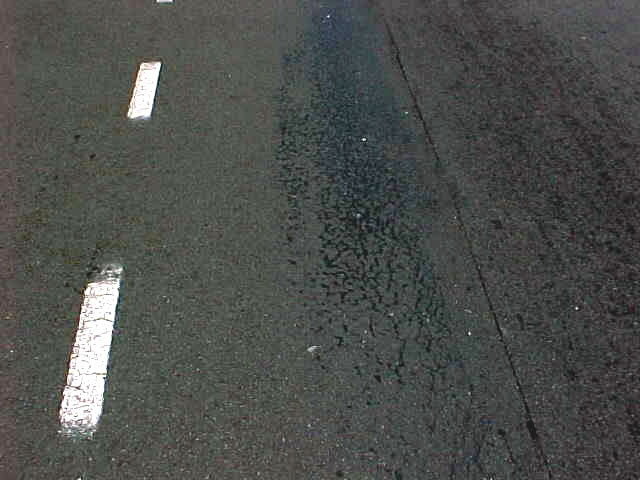 Minor bleeding can often be corrected by applying coarse sand to blot up the excess asphalt binder. 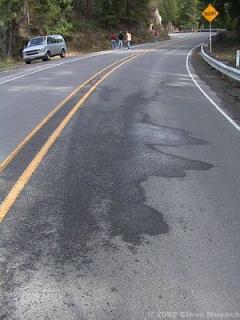 Major bleeding can be corrected by cutting off excess asphalt with a motor grader or removing it with a heater planer. If the resulting surface is excessively rough, resurfacing may be necessary (APAI, no date given). Block cracking in a parking lane. Parking lanes see little if any traffic, therefore the only likely distresses that will occur are raveling and block cracking. These cracks are probably too wide to be effectively crack sealed. Block cracking in a parking lane. 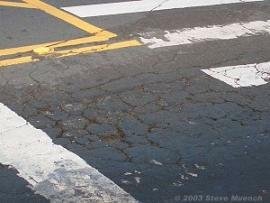 Description: Interconnected cracks that divide the pavement up into rectangular pieces. Blocks range in size from approximately 1 ft2 to 100 ft2. Larger blocks are generally classified as longitudinal and transverse cracking. Block cracking normally occurs over a large portion of pavement area but sometimes will occur only in non-traffic areas. Low severity cracks (< 1/2 inch wide). Crack seal to prevent (1) entry of moisture into the subgrade through the cracks and (2) further raveling of the crack edges. HMA can provide years of satisfactory service after developing small cracks if they are kept sealed (Roberts et. al., 1996). 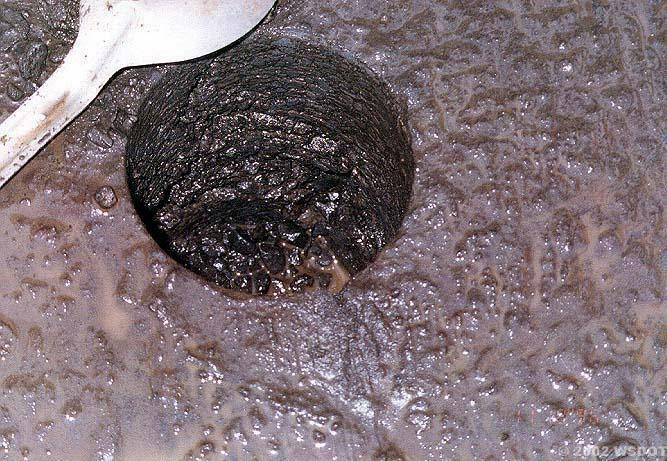 If looks are important, or cracking is extensive, a slurry seal can be placed over the sealed cracks. High severity cracks (> 1/2 inch wide and cracks with raveled edges). 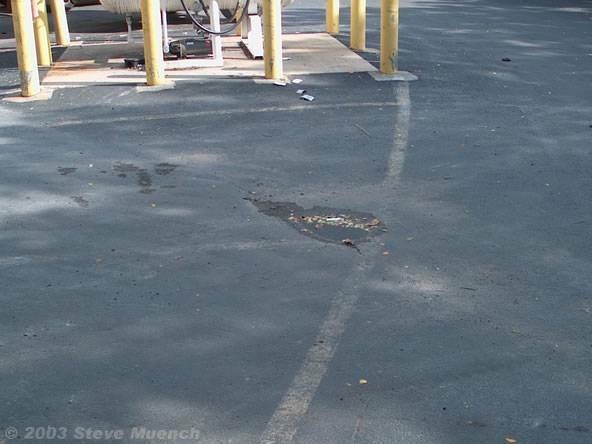 Remove and replace the cracked pavement layer with an overlay. Shoving at a busy intersection. Description: A form of plastic movement typified by ripples (corrugation) or an abrupt wave (shoving) across the pavement surface. The distortion is perpendicular to the traffic direction. Usually occurs at points where traffic starts and stops (corrugation) or areas where HMA abuts a rigid object (shoving). Small, localized areas of corrugation or shoving. Remove the distorted pavement and patch. Large corrugated or shoved areas indicative of general HMA failure. Remove the damaged pavement and overlay. Slight depression in the loading dock area of a hardware store. This is likely due to a localized area of soft subgrade. Depression in an access roadway probably caused by subgrade settlement. Note that the pavement has fatigue cracked significantly as it has settled. Description: Localized pavement surface areas with slightly lower elevations than the surrounding pavement. Depressions are very noticeable after a rain when they fill with water. Possible Causes: Subgrade settlement resulting from inadequate compaction during construction. Repair: By definition, depressions are small localized areas. A pavement depression should be investigated to determine the root cause of failure. Depressions should be repaired by removing the affected pavement then digging out and replacing the area of poor subgrade. Patch over the repaired subgrade. 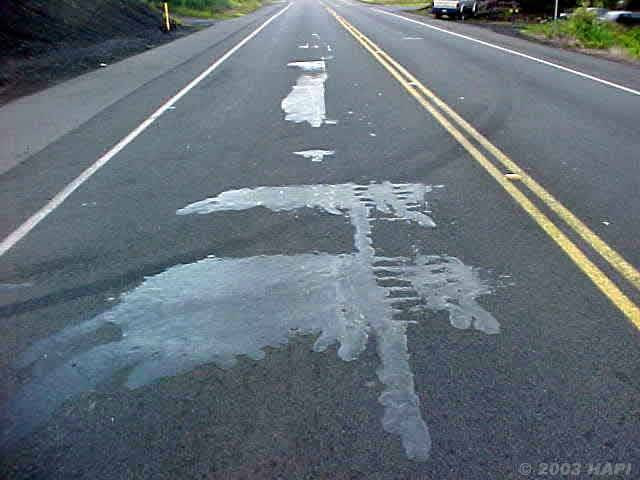 Joint reflective cracking on a low-use industrial road. Joint reflective cracking on an urban arterial. 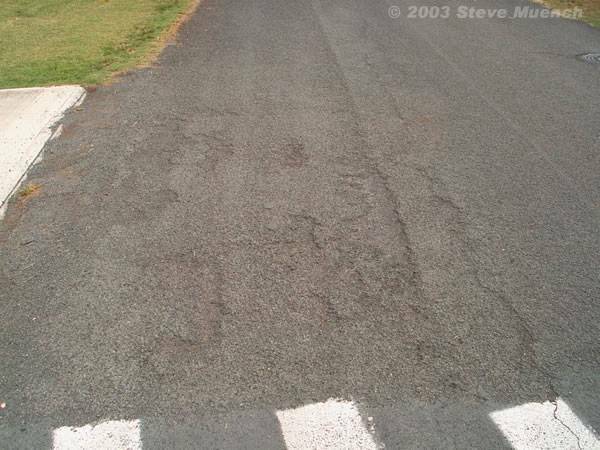 Description: Cracks in a flexible overlay of a rigid pavement. The cracks occur directly over the underlying rigid pavement joints. Joint reflection cracking does not include reflection cracks that occur away from an underlying joint or from any other type of base (e.g., cement or lime stabilized). 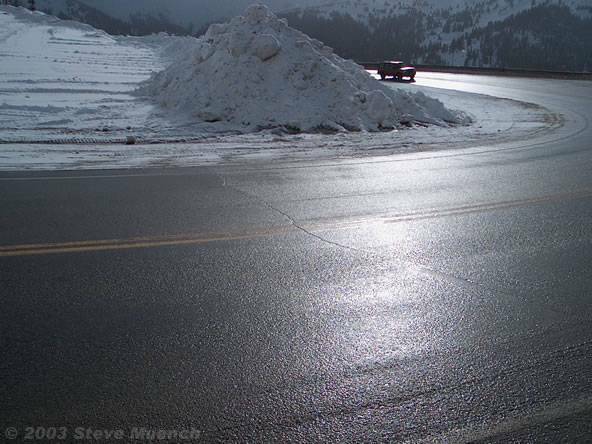 Possible Causes: Movement of the rigid pavement slab beneath the HMA surface because of thermal and moisture changes. Generally not load initiated, however loading can hasten deterioration. High severity cracks (> 1/2 inch wide and numerous cracks). 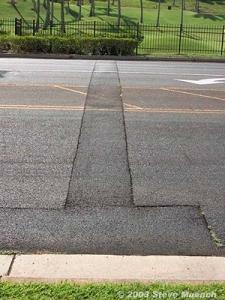 Remove and replace the cracked pavement layer with an overlay after proper preparation of the underlying rigid pavement. Longitudinal cracking. The cracking appears to be the onset of alligator (fatigue) cracking and may be occurring on the longitudinal joints. Longitudinal cracking on a collector street. The cracking appears to be the onset of alligator (fatigue) cracking and may be occurring on the longitudinal joints. 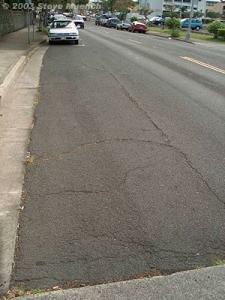 Description: Cracks parallel to the pavement’s centerline or laydown direction. Usually a type of fatigue cracking. Problem: Allows moisture infiltration, roughness, indicates possible onset of fatigue cracking and structural failure. Poor joint construction or location. Joints are generally the least dense areas of a pavement. Therefore, they should be constructed outside of the wheelpath so that they are only infrequently loaded. Joints in the wheelpath will general fail prematurely. Small utility patch on a collector street. Right: Larger Utility patch across an arterial. 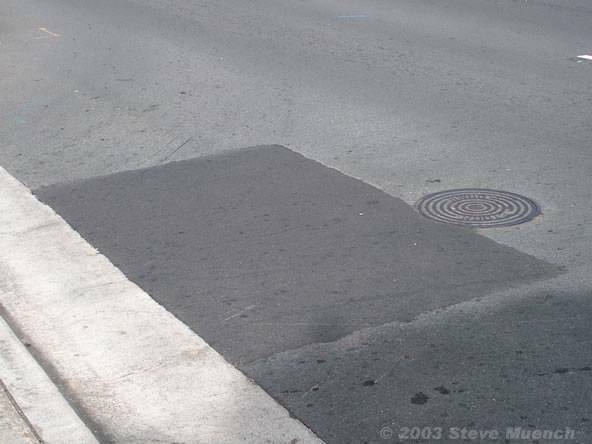 Notice that the patch edges are separated from the surrounding pavement. These edges need to be crack sealed to prevent water infiltration into the subgrade. 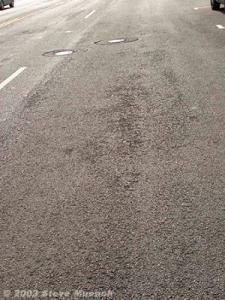 Description: An area of pavement that has been replaced with new material to repair the existing pavement. A patch is considered a defect no matter how well it performs. Repair: Patches are themselves a repair action. The only way they can be removed from a pavement’s surface is by either a structural or non-structural overlay. Two adjacent SMA pavements at the NCAT Test Track near Auburn, AL. 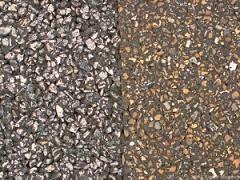 The pavement on the right uses river rock, which is more susceptible to abrasion, as its aggregate and is showing some signs of aggregate polishing. 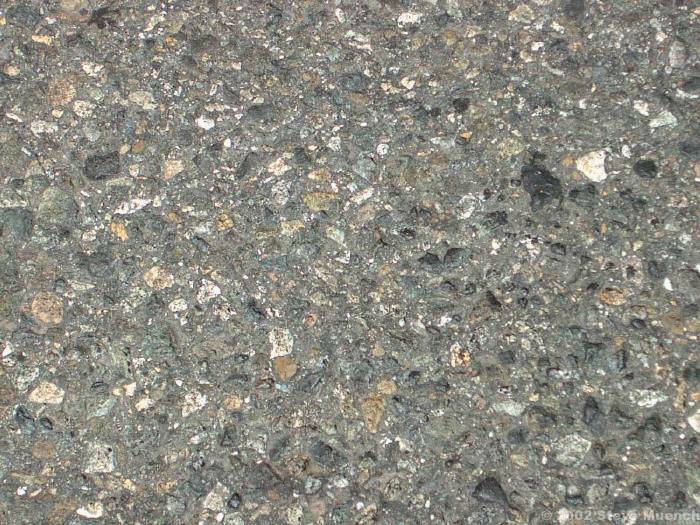 This close-up picture of a road surface shows aggregate wear after about 5 years of wear. Description: Areas of HMA pavement where the portion of aggregate extending above the asphalt binder is either very small or there are no rough or angular aggregate particles. Possible Causes: Repeated traffic applications. Generally, as a pavement ages the protruding rough, angular particles become polished. This can occur quicker if the aggregate is susceptible to abrasion. Repair: Apply a skid-resistant slurry seal, BST or non-structural overlay. Pothole forming from a badly fatigued wheelpath area on an arterial. Notice the water in the pothole even though it has not rained in almost 12 hours. Pothole on a major highway. The area has been repaired but the repair is failing. A more comprehensive effort is needed to correct this pavement failure. Description: Small, bowl-shaped depressions in the pavement surface that penetrate all the way through the HMA layer down to the base course. They generally have sharp edges and vertical sides near the top of the hole. Potholes are most likely to occur on roads with thin HMA surfaces (1 to 2 inches) and seldom occur on roads with 4 inch or deeper HMA surfaces (Roberts et al., 1996). 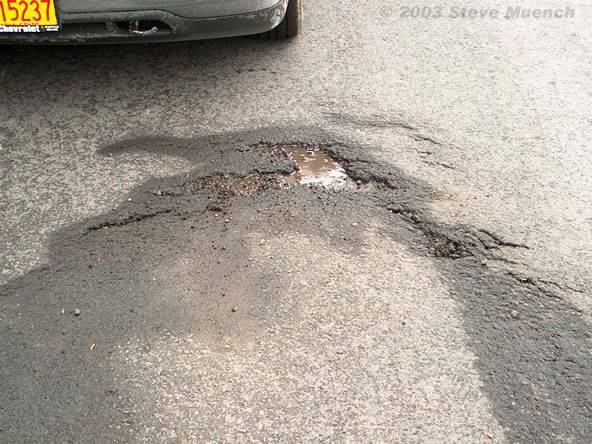 Possible Causes: Generally, potholes are the end result of fatigue cracking. 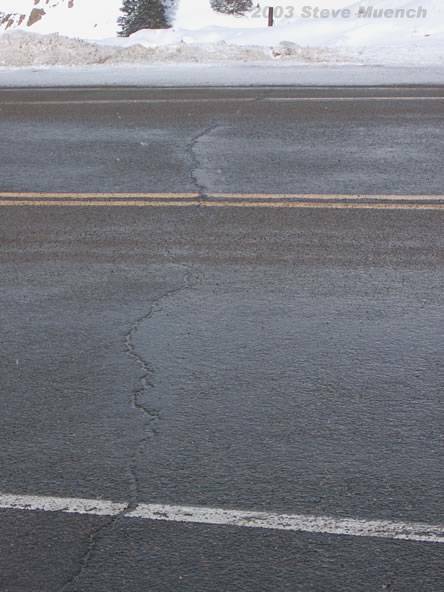 As fatigue cracking becomes severe, the interconnected cracks create small chunks of pavement, which can be dislodged as vehicles drive over them. 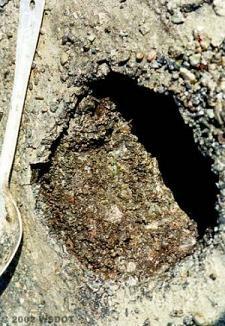 The remaining hole after the pavement chunk is dislodged is called a pothole. Repair: In accordance with patching techniques. This road has not been overlayed in almost 20 years. Additionally, it was used as an arterial bypass for 6 months as a sewer line was placed under the arterial. Raveled area on an arterial in Honolulu. This raveling is probably a result of segregation, temperature differentials or inadequate compaction. Description: The progressive disintegration of an HMA layer from the surface downward as a result of the dislodgement of aggregate particles. Asphalt binder aging. 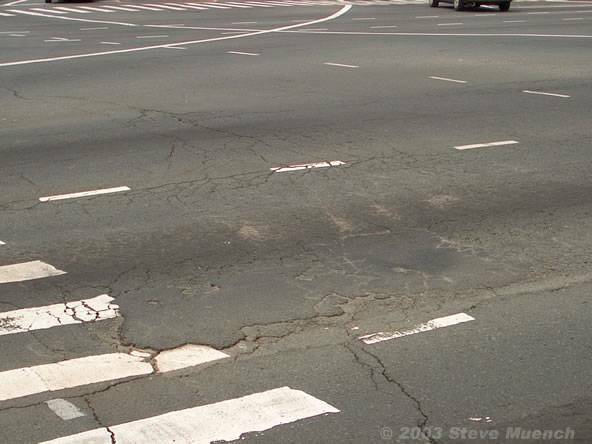 Aging is generally associated with asphalt binder oxidation as it gets older. As the asphalt binder gets older, oxygen reacts with its constituent molecules resulting in a stiffer, more viscous material that is more likely to lose aggregates on the pavement surface as they are pulled away by traffic. Inadequate compaction during construction. High density is required to develop sufficient cohesion within the HMA. Often, inadequate compaction will also result in rutting because once the pavement is opened to traffic, it will continue to compact in the wheelpaths under traffic loading. Mechanical dislodging by certain types of traffic (studded tires, snowplow blades or tracked vehicles). Small, localized areas of raveling. Remove the raveled pavement and patch. 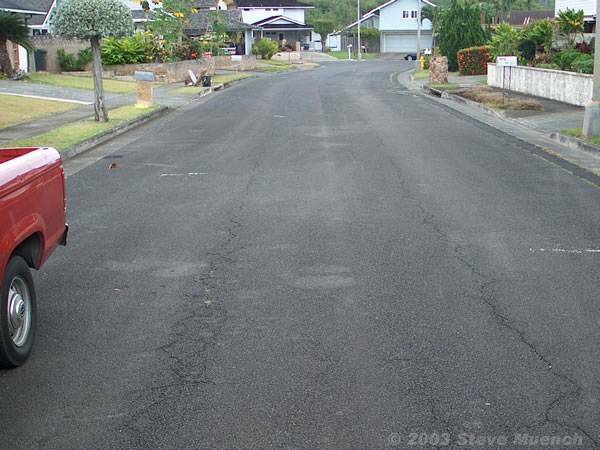 If the pavement is still structurally sound, the raveling can be fixed with a fog seal or slurry seal. 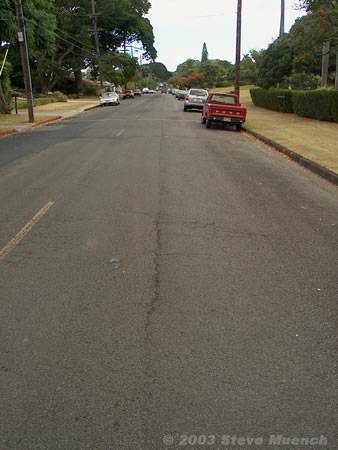 Shallow rutting on a Honolulu arterial. 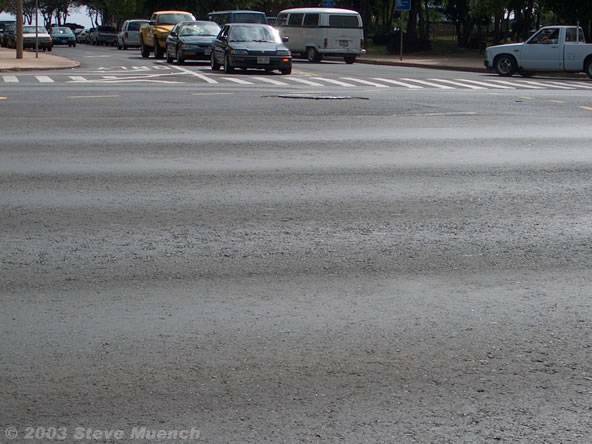 Shallow rutting on another Honolulu arterial. Description: Surface depression in the wheelpath. Pavement uplift (shearing) may occur along the sides of the rut. Ruts are particularly evident after a rain when they are filled with water. There are two basic types of rutting: mix rutting and subgrade rutting. Mix rutting occurs when the subgrade does not rut yet the pavement surface exhibits wheelpath depressions as a result of compaction/mix design problems. Subgrade rutting occurs when the subgrade exhibits wheelpath depressions due to loading. In this case, the pavement settles into the subgrade ruts causing surface depressions in the wheelpath. Problem: Ruts filled with water can cause vehicle hydroplaning, can be hazardous because ruts tend to pull a vehicle towards the rut path as it is steered across the rut. 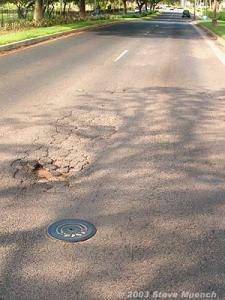 Repair: A heavily rutted pavement should be investigated to determine the root cause of failure (e.g. insufficient compaction, subgrade rutting, poor mix design or studded tire wear). Slight ruts (< 1/3 inch deep) can generally be left untreated. Pavement with deeper ruts should be leveled and overlayed. Slippage crack on a truck haul road. Slippage crack possibly caused by poor tack coat bonding. 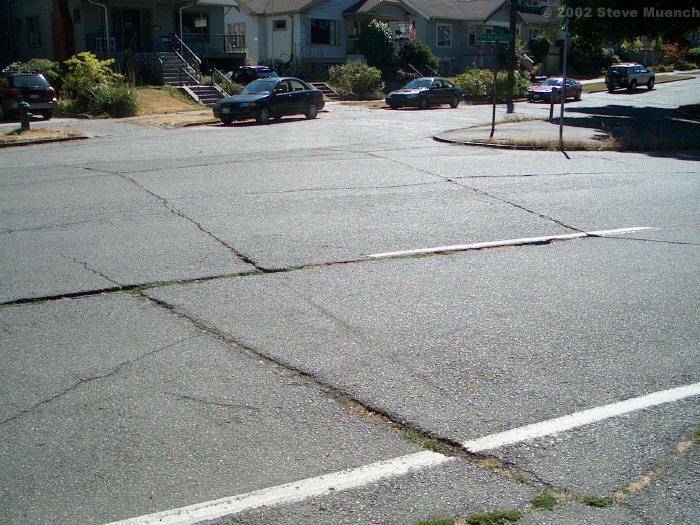 Description: Crescent or half-moon shaped cracks generally having two ends pointed into the direction of traffic. 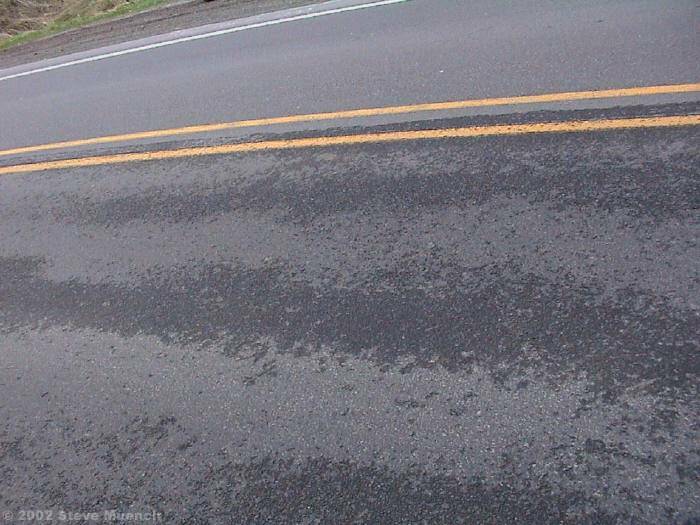 Possible Causes: Braking or turning wheels cause the pavement surface to slide and deform. 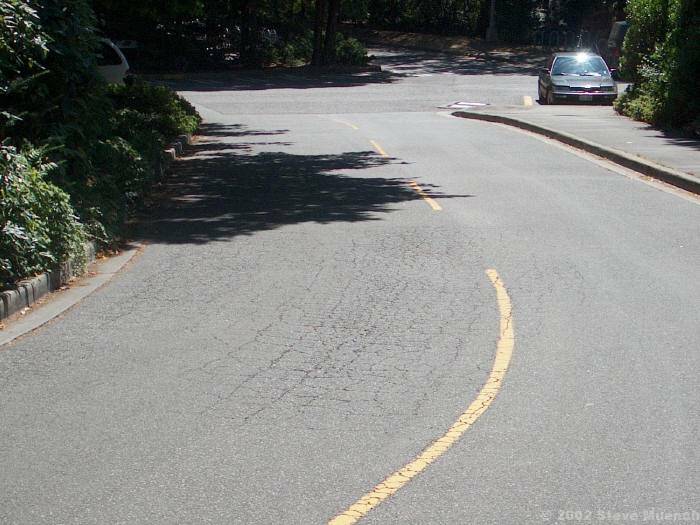 The resulting sliding and deformation is caused by a low-strength surface mix or poor bonding between the surface HMA layer and the next underlying layer in the pavement structure. Repair: Removal and replacement of affected area. A small pavement core showing stripping at the bottom of the pavement section. Picture taken in Washington State. Description: The loss of bond between aggregates and asphalt binder that typically begins at the bottom of the HMA layer and progresses upward. When stripping begins at the surface and progresses downward it is usually called raveling. Repair: A stripped pavement should be investigated to determine the root cause of failure (i.e., how did the moisture get in?). 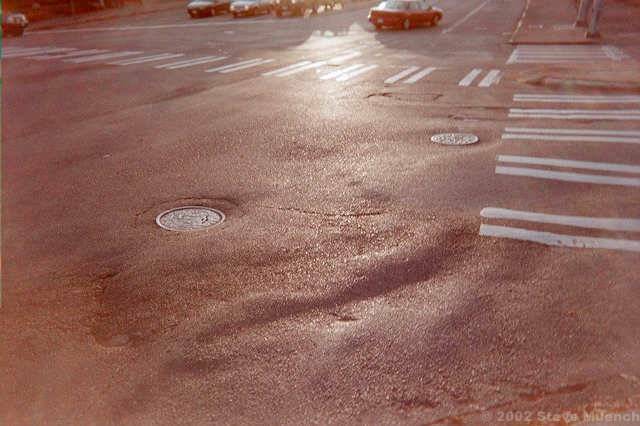 Generally, the stripped pavement needs to be removed and replaced after correction of any subsurface drainage issues. Transverse crack near Loveland Pass, Colorado. 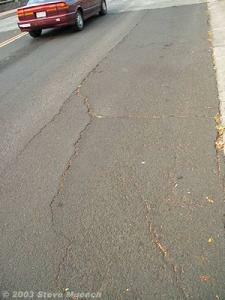 Description: Cracks perpendicular to the pavement’s centerline or laydown direction. Usually a type of thermal cracking. Shrinkage of the HMA surface due to low temperatures or asphalt binder hardening. Water bleeding through a pavement surface. Enlarge Similar conditions. Picture taken in Washington State. Description: Water bleeding occurs when water seeps out of joints or cracks or through an excessively porous HMA layer. Pumping occurs when water and fine material is ejected from underlying layers through cracks in the HMA layer or out the sides of the HMA layer under moving loads. Repair: Water bleeding or pumping should be investigated to determine the root cause. If the problem is a high water table or poor drainage, subgrade drainage should be improved. If the problem is a porous mix (in the case of water bleeding) a fog seal or slurry seal may be applied to limit water infiltration.